1 tablet daily, unless otherwise advised; take half an hour before bedtime. Filler: microcrystalline cellulose, anti-caking agent: maltodextrin, magnesiumsalt of fatty acids, firming agent: silicon dioxide, glazing agent: hydroxypropyl methylcellulose, melatonine. What is Melatonine 3 mg? Melatonine consists of round, white, tablets each containing 3 mg of the active ingredient melatonin. Melatonine can be used by persons above 12 years of age. Melatonine is taken half an hour before bed-time. Melatonine is rapid absorbed within 30 minutes to one hour after ingestion. Indications for use are to reduce the time it takes to fall asleep and to alleviate the subjective feelings of jet-lag. Most melatonin products comes in nutritional quality. Melatonine comes in pharmaceutical quality. Potential impurities are almost undetectable, including tryptophan. Melatonine tablets are free of sugar, yeast and gluten and are also suitable for vegetarians. Melatonine seemingly has no known toxic effects but are not suitable for children under 12 years, pregnant and breastfeeding women. The optimum time to take Melatonine is 11pm - 11.30pm but if you work at night and must sleep during the day, take Melatonine 30 minutes before you go to bed. Supplementation of Melatonine should only be taken before going to sleep. It is not recommended to drive or handle potentially dangerous machinery after taking melatonine. Pregnant and breast feeding women should not take Melatonine. Melatonin is a natural component found in a long line of living organisms . We find a high amounts in the fruit of bananas and in plants of the rice family. In most animals including man, melatonin functions as a key substance regulating seasonal and diurnal rythms. 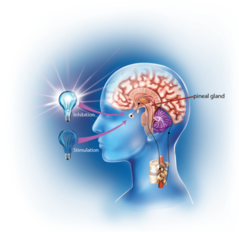 In humans melatonin is secreted from the pineal gland in the brain and controlled by a region of the hypothalamus. The synthesis and release of melatonin is stimulated by darkness and peaks between 2am and 4am and is inhibited by light. If you get up during the night and turn the light on, your body's melatonin production will immediately stop and only reach maximum production again after some hours of darkness. However, not all frequencies in the light spectrum attenuates the production of melatonin. It is only light in the blue end of the visible light spectrum, which attenuates the production of melatonin, but this type of light is present in many artificial sources of light. In humans the brain's nocturnal production of melatonin is at its highest from 4-7 years of age until adulthood. Hereafter production gradually declines the rest of our life. Where can melatonin be found? In the brain, we have a sort of a biological clock that controls our circadian rhythm. This circadian rhythm is the physical, mental and behavioral changes that follows a cycle close to 24 hours. The rythm primarily responds to light and darkness. Our biological clock maintains an individual circadian rhythm which are not totally equal to 24 hours, it might be a little shorter or a little longer, but is adapted to a 24 hour daily rhythm by means of the the daylight, that hits the eye. Examples of areas where supplementation with melatonin is used. Three mg is the most commonly used dose in the study of the effects of melatonin. Ingestion of melatonin causes that you fall asleep faster, but the effect happens indirectly by influencing the body's core temperature and several brain neurotransmitters. Also old people suffering from this kind of sleep problem can benefit from melatonin supplementation. Flying across multiple time zones is known to cause a disturbed circadian rhythm and accompanying discomfort. Normally we can move our circadian rhythm approximately 1 to 1 1/2 hour a day. If we fly eg. 6 time zones away, it can take 4-6 days before our circadian rhythm is fully adjusted to the new local time. Typically, we experience more discomfort by flying east (toward the Sun) than flying west. Some are better than others to cope with shifting time zones. Working in shifts can also cause symptoms similar to jet lag if you eg. ẃork at night every other week. It important to sleep in a dark room although you have to sleep during the day. Melatonin can be used by adult, blind persons. Blind persons may find it difficult to fall asleep at night because they do not in the same way experience the change of light between day and night. * The beneficial effect is obtained with a minimum intake of 0,5 mg to be taken close to bedtime on the first day of travel and on the following few days after arrival at the destination.